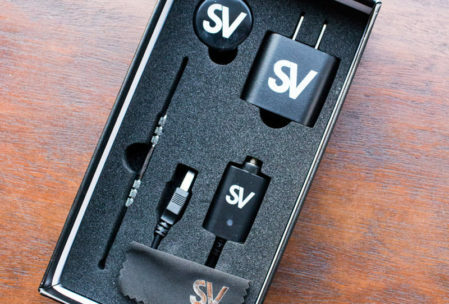 We’ve had a few run ins with Source Vapes at trade shows, but never really had the chance to check out their products until now. Source Vapes was kind enough to provide us with a sample Source Orb 4 Premium Kit. The Source Orb 4 vape pen might just be one of the most customizable wax vape pens we’ve used to date. 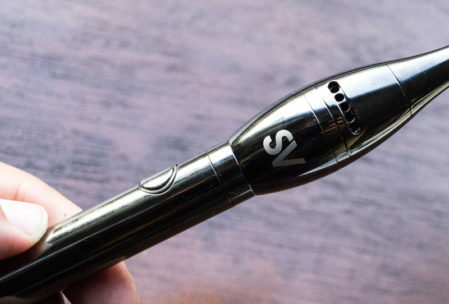 Source Vapes has been tweaking their Source Orb vape model over the years to perfect this wax vape pen. This fourth edition is hands down the most impressive iteration. 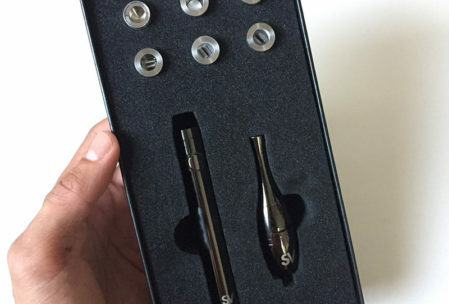 The Source Orb 4 Premium Kit includes 6 interchangeable atomizers, improved airflow control, and an adjustable voltage battery. With so many atomizers and settings options, the Source Orb 4 allows you to fine-tune all aspects of your vape experience exactly to your liking. The Source Orb 4 vaporizer looks and feels very similar to the metallic stainless steel body of other vapes, like the Rokin wax vape pen. 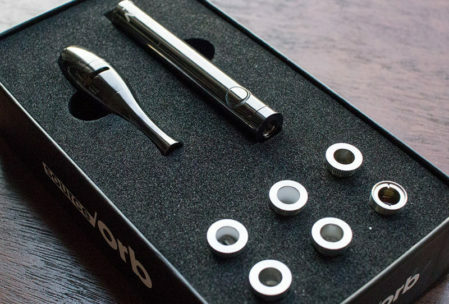 However, what sets the Source Orb 4 apart from other vapes is not only the fact that it’s created with stainless steel 303 (“the healthiest material a vape pen has ever been made with”), but also it’s hourglass-shaped upper half. The top attachment includes a narrow mouthpiece, magnetic atomizer holder, and one of the Source Orb 4’s most notable features, it’s variable airflow system. The Orb 4 kit includes a variable-voltage battery with a twist knob on the end of it to adjust the heating intensity. The voltage ranges from 2.7-4.2v. 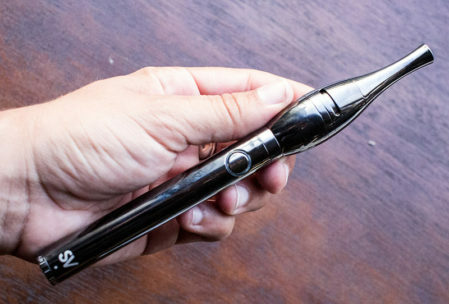 This vape pen looks and feels great in your hand. It features a cool blue halo around the power button when pressed. The button begins to turn purple and pink as the battery becomes drained. The airflow control allows the user to choose their desired airflow density between 5 different settings. Airflow controls are becoming a common feature with vape pens, but the Source Orb 4 airflow is unprecedented. The mouthpiece attachment has 10 holes which allows for the utmost control of your vape and the size of your hit. The Source Orb Premium Kit comes with 6 different atomizers — 1 x single coil, 3 x double coils, and 2 x coilless — that all have their own benefits (learn about each atomizer). We used some Angel City Wax to test out each of the six atomizers. The quartz single coil and double coil atomizers heat up and vaporize really fast, giving off a tasty and slightly harsher hit from a smaller and shorter inhale. We hit both of the quartz coil atomizers at a lower temp than when we used the other atomizers. Each draw produced really flavorful hits of vapor. We really enjoyed vaporizing with both the black and ceramic dual coil atomizers. They both produce a really smooth and clean tasting vapor. If you’ve never vaped with a ceramic coil before, it’s definitely something you should try. The quartz and ceramic rod atomizers are excellent at producing lots of vapor and hard hits. The black ceramic one is different because it’s meant for thinner oils that can absorb into it and vape at slightly lower temps. The porous black ceramic is pretty much exclusive to Source Vapes. The Source Nail Gr2 titanium atomizer is made with USA-tested grade 2 titanium, which quickly vaporizes at super hot temperatures without compromising flavor. Wax can be runny, sticky, and messy at times, but with this coilless option, loading your atomizer is easy and hassle free. The coilless titanium G2 nail atomizer is our personal favorite and the atomizer we used the most. We also noticed that this titanium coilless atomizer heated up the wax quickly and evenly, giving off much better vapor quality and full-bodied flavor. 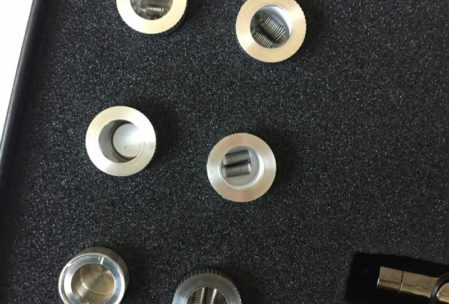 If you’re somebody who enjoys getting pretty large rips, the titanium atomizer will work great for you, as it produces pretty huge clouds of vapor. We were really excited to use the Quartz Plus coilless atomizer. The Quartz Plus atomizer features a flat ceramic plate as its base and works as the heating element. It’s enclosed in a quartz housing to ensure the wax slides down the walls to the base which minimizes waste. This is our second favorite atomizer to use behind the titanium nail. We recently reviewed the FLO True Taste vape pen which also uses a coilless atomizer design. In contrast to the Source Vape design, there’s no doubt that the Source Orb 4’s vapor quality is leaps and bounds ahead of their competition. 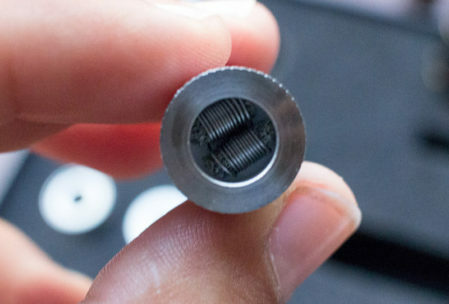 Source’s coilless atomizers provide full, consistent, and truly lush hits. Honestly, all of the atomizers provide an enjoyable vaping experience. But, it’s cool to be able to switch it up and have different types of atomizers to try with each concentrate. The flavor is great with all of them, however, you’ll notice subtle differences in how the vapor tastes when using the three materials (titanium, ceramic and quartz). All of these atomizers are compatible with Source Vapes’ 4 series devices. Trying to choose from the six atomizers provided in this kit can be a bit overwhelming. We first decided to use the Source Nail Gr2 titanium, probably because we’re still pretty fascinated with this whole coilless atomizer trend. We loaded it up with some Angel City Wax and snapped the magnetic mouthpiece back into place. The magnet provides a solid connection between the atomizer and the mouthpiece; it doesn’t feel loose at all. 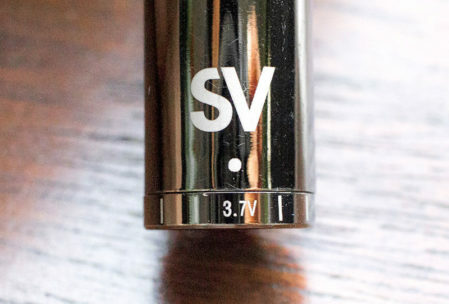 The voltage range for this specific atomizer is 4.2v. If you want to produce smaller hits, lower the voltage and hold the button down for shorter periods of time. We suggest holding the button for a few seconds prior to beginning your draw. This method ensures that your concentrate melts a bit, resulting in a bigger hit. The first cloud that we exhaled tasted great. Sometimes initial hits can taste burnt, but we didn’t experience that with the Source Orb 4 quartz plus. Just a small dab of wax produced three rather large clouds and a couple small hits as it trailed off. On lower voltage settings, it would have gone even further. The Source Orb 4 has excellent vapor quality, and some atomizers produce better tasting vapor than others. 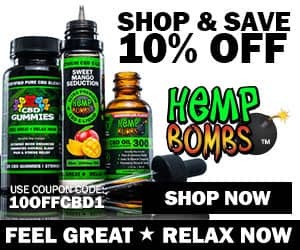 If you’re going for flavor, you’ll want to use either the black ceramic double-coil atomizer (less viscous oils and concentrates seep into the porous black ceramic) or the quartz plus coilless atomizer. These both produce very clean tasting vapor. If you’re somebody who enjoys getting larger hits, but without compromising all flavor, the Source Nail Gr2 titanium atomizer will be your go-to! Between 5 settings of variable airflow, and being able to choose from a variety of coiled, doubled coiled, and coil-less ceramic, quartz, and titanium atomizers, you truly can vape to your liking more than ever before. No question that the best part about the Soucre Orb 4 is the six atomizers that you get. With six atomizer options, you can essentially vaporize any type of concentrate to perfection. The Source orb 4 Premium Kit is $99.95 and can be purchased directly through Vapor Nation. 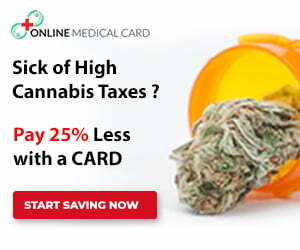 Check out similar wax and cannabis concentrate vape reviews.